The “new normal” is masking some historic challenges. China’s troublesome stock market volatility brings to mind Dickens’ characterization of France just before the revolution: the best of times and the worst of times. China’s booming real economy over the past three decades has been the best of times. The worst of times may lie ahead, struggling with the financial economy. The question is which will prevail, and ultimately, will the French example prove ominously foreshadowing. China’s rise has and continues to depend on progressively unleashing the real economy. The new normal is a shift from high speed to a more reasonable and sustainable growth path. China claimed more than 10 million urban jobs created in 2104. An aggressive program of reforms is expanding the foundation for continued growth. Years of reform and market opening have spurred local governments to harness entrepreneurial energy and foreign investment in special customs supervision areas, export processing zones, and cross-border industrial parks. The new Shanghai Pilot Free Trade Zone is a major experiment in reform that has led to three new free trade zones, in Guangdong and Fujian and Tianjin. The State Council reported that 632 administrative approval items were dismissed or relegated to governments at lower levels. Restrictions on some investments are being loosened. Some services are being encouraged. China is opening the door to private investors in oil and natural gas exploration and banking. Private capital is encouraged for railway construction. The price mechanism for agricultural products and public service products are also undergoing reform to increase production and efficiency. More than 1,000 hospitals have been privatized or started new as private firms. These are important steps toward improving corporate governance and bringing the market to bear on corporate decision-making. There is much more to do, of course. China is on a long, difficult path to become a modern, knowledge-based, service oriented economy. Significant progress has been made over the past several decades, underlying the remarkable growth that has lifted hundreds of millions out of poverty, made China a major export market for 140 nations, and lets China claim credit for nearly a quarter of global economic growth. This success is what makes the financial problems in China so alarming. The debt-GDP ratio is rising faster than it is in other emerging markets. Indeed, it may be the fastest absolute build-up ever. McKinsey reports that China’s total debt in 2007 held by private households, independent firms and government institutions hit 158 percent of the country’s GDP, among the worlds highest for major economies. It had risen to 200 percent by 2014 and continues to climb. Fundamental governance problems are being exposed. Nearly half of local government revenues come from the sale of land. Most of rest comes from loans from local government financing vehicles (LGFVs), using public land as collateral, funded the feverish growth in highways, high-speed railways, airports, subways, and other infrastructure. Local governments have tried to keep real estate prices high by strategically selling incrementally smaller plots of land. Local governments also created their own LGFVs to purchase the land from themselves in order to create the appearance of demand and to keep land prices and government revenues high. LGFVs have been so clever at circumventing Beijing’s prohibitions against local government borrowing that nobody, not even the Ministry of Finance seems to know how much many of the local governments owe. Estimates reach $5-7 trillion. 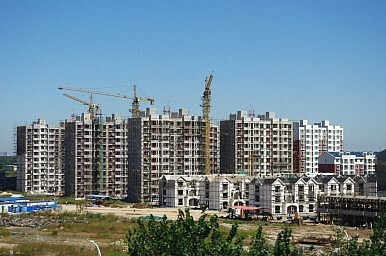 China seems to be facing a turning point in real estate this year. Prime land is already gone. Where markets have seen 17 and 26 percent increases in prices and proceeds, new property sales fell 7.6 percent and 6.3 percent respectively. Worse, there is a worrisome excess supply, by at least one estimate a 20 percent vacancy rate in urban housing. A recent Goldman Sachs report estimates that there is 75 billion square feet of space under construction or ready to occupy – a five year supply at current sales/occupation rates. Even more troublesome, Zhang Zhiwei, chief China economist for Deutsche Bank, suggests that 43 percent of land auctions in Jaingsu Province in 2014 were won by local government-owned shell entities formed to bid up prices and keep land valuations high. Such phantom sales cannot keep land values from falling for long. They make borrowing harder and paying off existing debt extremely difficult, if not impossible. Provincial and local governments are left holding too much short-term debt. To help restructure its debt load, China’s State Council announced recently that local governments could issue up to $480 billion worth of long-term bonds to pay off existing debt. One distinctly possible unintended consequence is that allowing local governments to issue long-term debt could open up a serious avenue to further debt accumulation that local governments cannot or will not actually pay back, as was the case in the early 1990s. In similar fashion, Beijing has tried to temper the credit-fueled stock market bubble built on investors borrowing heavily to speculate in the market. When it burst, the government encouraged more buying: It cut interest rates, cajoled in speeches and articles, funneled pension funds, loosened restrictions on margin trading, cut trading fees, blasted short-sellers, and now offers more liquidity to brokers who can provide yet more credit to fuel more speculative buying. The potential catastrophe, starting with retail investors portends, harkens back to 1789 France, the worst of times. Significant and broad dissatisfaction is not inconceivable. China has been a remarkable economic success story. But there are glaring signs of unsustainability. China’s new normal is a clever way to make the forces coming down on the Chinese economy seem, well, normal, desirable, even strategically controlled. They are not. These are complex and precarious economic conditions in part being thrust on China and in part being manufactured by China. Failure to overcome them will have disastarous implications for the whole world. Robert A. Rogowsky is Professor, Middlebury Institute of International Studies; Adjunct Professor, Georgetown University; Sr. Research Fellow, Center for Chinese Globalization, Beijing,; and former Chief Economist, U.S. International Trade Commission.